…to massive, circular parking lots. I somehow doubt Valencia would have maintained its bicycle friendly charm. Some context is in order. 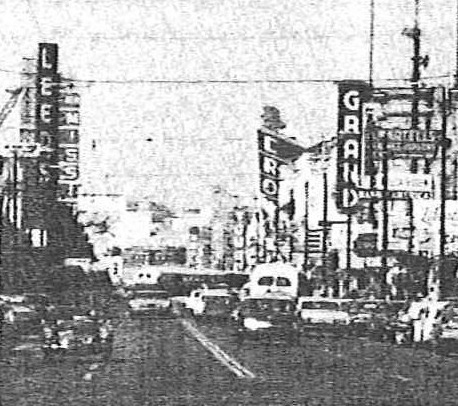 This was the “Miracle Mile” — the Mission used to be one of the primary shopping districts in the city (there was a Sears at Mission and Army, after all — that was probably what the second walkway over Army St was for). I am sure theses 50s/60s era planners were hoping to stem the flight to the suburbs as the city depopulated around them. This is of course a completely different approach of construction destruction than the post-WWII SF freeway plans that we’ve discussed before — imagine a huge Geary-like trench through the Mission, and a highway on the west slope of Bernal, along Coleridge. 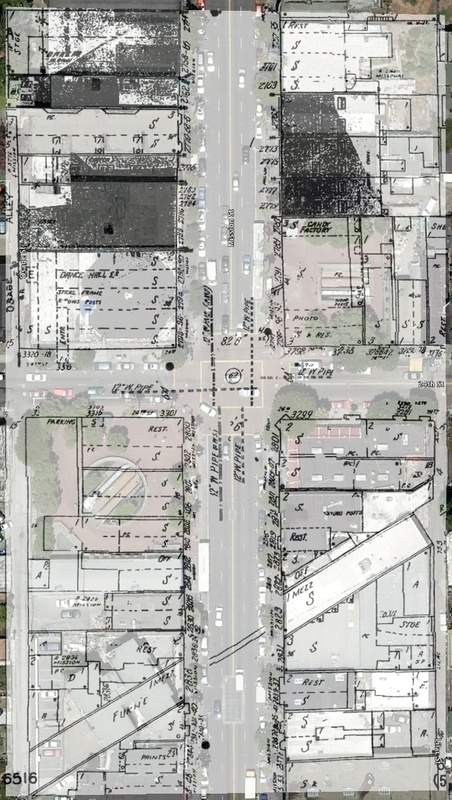 Detailed map below of the Mission Freeway from 30th to 14th (south is up). basically, all the odd-numbered streets except 21st would have been cut off, and the even-numbered streets would have been bridges (think Fillmore over Geary). 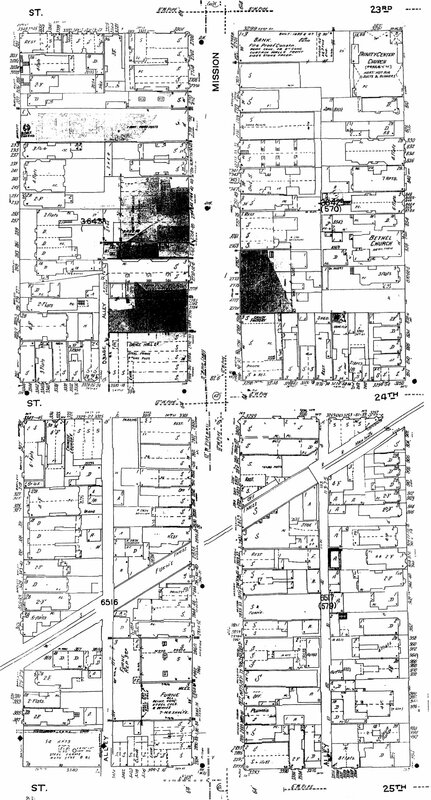 Here’s a bunch of 1950 Sanborn maps jammed together to give you an idea of what the pre-BART 24th and Mission was like. (Click to zoom). The NE and SW corners of the intersection are obviously gone. 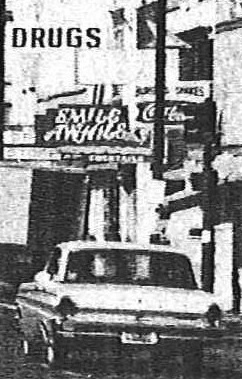 The McDonalds took out the SE corner, but the building next to it (Last’s Paints) is still there (now Western Dental / Mr. Pollo), as is the Dance Mission Theater building on the NW corner. Note the stores in the diagonal slot where the railway used to be. 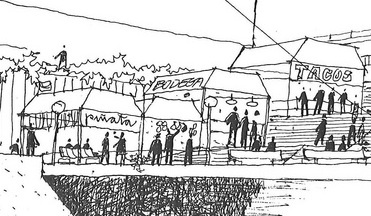 Next time you have a sausage and beer at Rosamunde, remember that you are sitting right on the railway tracks. Theater marquees a few blocks down the street: Grand. Crown. New Mission. Tower. 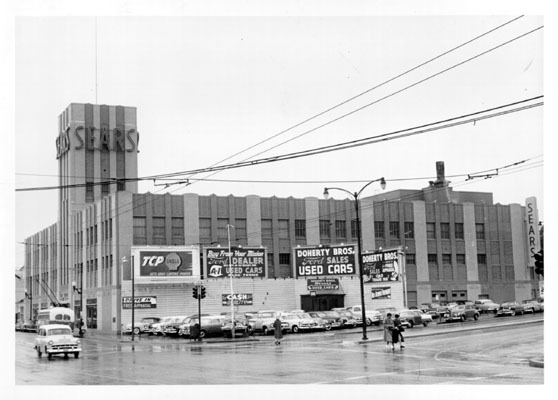 Also the Leeds / Sketchers sign. No trees at all. Hey, that sign sure is a funny shape. Jigjag, jigjag. Just north of 24th. Where have I seen that before? El Farolito, continuing the tradition of old school Mission signs. And this concludes today’s lesson in Mission bar and infrastructure history. you, sir, are a raging genius. thank you. Thanks for all the additional map and photo research! What a strange and unwelcoming place the future of the past was. Oh man, that is amazing. There but for the Grace of God, etc. 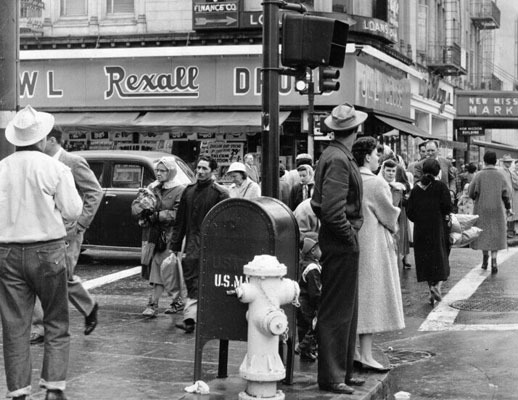 Scary to think that the Mission could have gone the way of the Fillmore/Embarcadero. 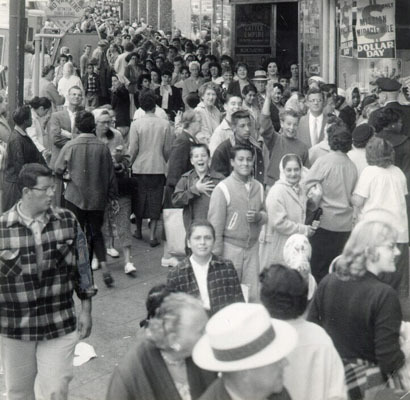 It’s worth noting too, that those plans would have had a much greater chance of occurring had not it not been for the intense and steady organizing in the community, including especially the Mission Tenants Union and eventually the Mission Coalition Organization. It led to Model Cities Money pouring in and a whole community planning process that more or less stopped Redevelopment in the Mission… but it’s happening now more stealthily! anyway, thanks as always to Eric and El Doctor de la Lengua… awesome! The more I read, the more I also want to credit Allan Jacobs and the Planning Department from the era when he was Director with saving San Francisco. 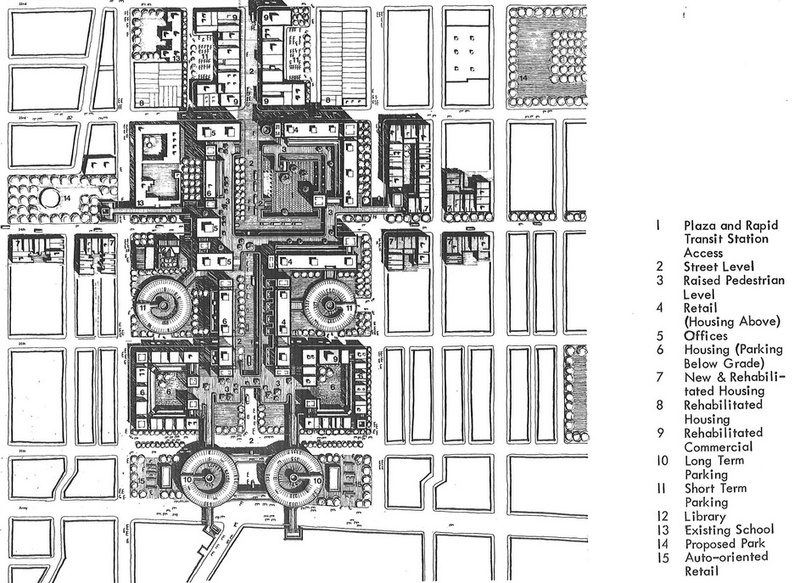 It was his department that totally rewrote the car- and demolition-oriented World War II-era Master Plan into the form that more or less still stands today. 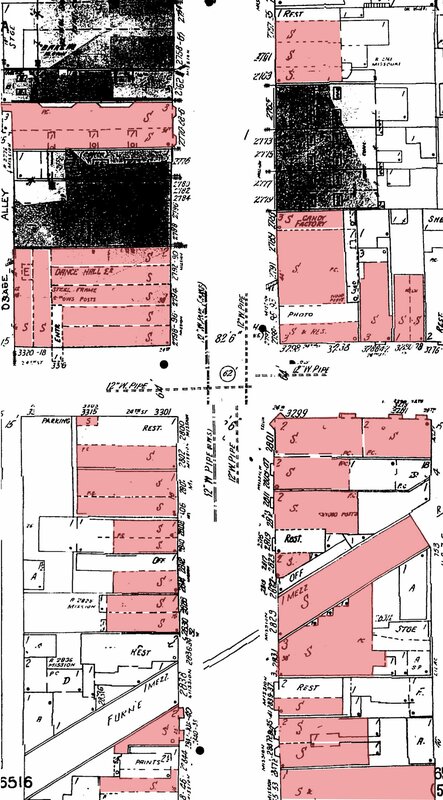 They were also apparently responsible for stopping the Redevelopment Agency from bulldozing several neighborhoods by stepping in preemptively with resident-driven housing rehabilitation programs to get the neighborhoods back into shape before the Redevelopment Agency had a chance to declare that the areas were substandard and had to be demolished. Thank goodness we didn’t get pedestrian bridges over Chavez! Added a few more pictures of the intersection, along with links to the post WWII Mission Freeway plans. Rosamunde is *on* the railroad tracks. (Google Maps has its business labels wrong). Thank, fixed it — that’s what I thought but the Google business name threw me off. Well, I have to say… I love the Embarcadero center. I really like the idea that cars and pedestrians are separated on different elevation levels. As for 24th Street BART… That corner really could use some work, and adding taller mixed-use buildings could work. 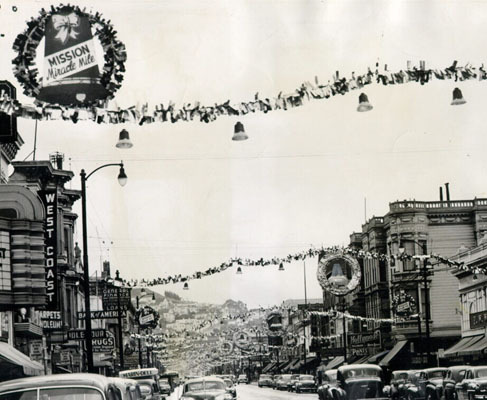 I especially love the photo showing the New Mission, the Crown and the Grand. Spent way too many weekend hours inside those theaters. Walked down Mission the other day for the first imte in many years. The change between then and now was staggering. I’m still reeling.. Thank you for posting. Can’t imagine the changes you see. If you had any pictures from your movie theater days I would love to see (and post) them. Any stories too!